Once every few years a diamond so tremendous comes along that the sale of it makes headlines. In case you haven’t caught the latest news in the diamond world, a historic 6-carat “Farnese Blue” diamond just sold for $6.7 million to an anonymous buyer. The pear shaped fancy dark gray-blue diamond was found in the Golconda mines of India, which also produced the famous Hope and Wittelsbach-Graff diamonds. 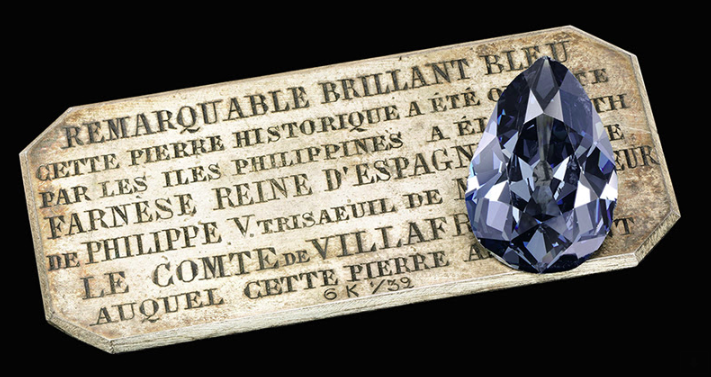 This diamond was one of the few gems that made it through a treacherous journey from Cuba to Spain in 1714 as a wedding gift to the Queen of Spain, Elisabeth Farnese who was to marry King Philip V of Spain, grandson of Louis XIV, King of France. . The “Farnese Blue,” diamond was kept secret for centuries as it passed through the hands of some of Europe’s most important royals, much of which is documented. It is a ring that will continue to be a part of our world’s history due to the rarity of the color, size and the number of historical figures that it has been passed down to. But that wasn’t the only diamond to make headlines this past Tuesday. Two other jewels went for even higher prices, also eclipsing their estimates. An oval diamond ring weighing 50.39 carats went for 8.1 million francs, while a round brilliant-cut diamond weighing 51.71 carats sold for 9.26 million francs. These stories are a testament to the unspoken value of naturally occurring diamonds, unlike man made diamonds, that cannot offer the same real and emotional value. How do you view diamonds such as this 6-carat “Farnese Blue?” If given the opportunity, would you hold on to a gem such a this? Leave us your comments below.